"We see a lot of things every day in this vast flowing digital stream. When I looked at the painting, I had two immediate sensations: I know this place and What is this painter doing?" "I first met Julia on twitter last year and was tremendously impressed with both her art and her ability to write about art and ideas on her blog. Julia has a depth of education that informs her work and a passion for sharing that knowledge both through teaching classes and writing online. At the end of last year, I noticed that Julia's studio sale seemed to be going remarkably well as she tweeted about work that was selling. When I asked her about it recently, she told me that she had sold quite a lot of paintings, more than often sell in a gallery show. And she had done even better the year before when the economy was having it's darkest hour. We'll discuss her strategies for successful self-produced shows, how teaching art can be an unexpected avenue for sales of art, and how to run an art school as an independent artist." John T. Unger has a new, online radio show called Art Heroes Radio. Sometimes it's a call-in show and sometimes he interviews someone. Sometimes he simply talks to his listeners. The topics are thoughtfully chosen and relevant to artists and entrepreneurs - such as the science of creativity, distractions that come disguised as opportunity, and how to build a website that works. John will be interviewing me Thursday, April 22 at 6pm Pacific Standard Time about how I make my living teaching and selling my work. You can listen live, or catch the post later. Read more and tune in to Art Heroes Radio here. 14th & Leary, Oil on Panel; 9 3/4" x 7 1/4"; 2006"I like these a lot. So many contradictions here that get the mind working: They’re free and fluid at the same time they’re meticulous and tightly crafted. They’re abstract and at the same time pictorial. Flat and layered. And they make me think of the built environment in new ways–both fractured and coherent, beautiful and manufactured. There were several of these that I’d like to have for my own!" Anna comments on the work in my 2009 show at the Sightline Institute, "Urban Perspective: Julia Hensley's City Views"
"I will be sad to see the pieces go at the end of the month. They’ve prompted me to think about art and creativity, and their role in sustainability. At first, they might seem tangential, but I see the arts as perhaps the ultimate destination of the movement toward sustainability. The arts, in general, involve a tremendous amount of value and an inconsequential quantity of resources. “Consuming” art — whether paintings, or photography, sculpture, music, dance, theater, film, poetry, literature — is a way in which we can add tremendous value to daily life, while consuming very few natural resources. “More fun, less stuff” is one definition of sustainability I made up in about 1990 (since turned into bumper stickers by my friends at the Center for a New American Dream). The arts embody that principle." Alan Durning comments on my solo show in 2009 at the Sightline Institute, "Urban Perspective: Julia Hensley's City Views", curated by Becky Brooks. Read Alan Durning's comment on Sightline Institute's art blog, set up to encourage conversation about art and sustainability and explore their connection. Panning For Gold Blindfold, Gouache and Acrylic Collage on Watercolor Paper; 30" x 22"; 2008"Julia Hensley's works on paper are saturated and warped. They dangle from thumb tacks. Simple painted shapes are carefully cut and scattered within and throughout seas of blended color, transforming two-dimensional works into a floor-to-ceiling explosion. To step back is to witness Hensley's illogical architecture; her own angst-ridden order. Not only does it work, it captivates." Exerpt from Angie Jones's review of "Inspired Geometries" at Form-Space-Light Gallery in 2008. To read the full review click here. This Storied Heart, Gouache and Acrylic Collage on Watercolor Paper; 45" x 52"; 2008"Seattle painter and Pratt Instructor Julia Hensley is unveiling two of her most recent works on paper completed in late winter of this year. She is well known for her meticulously crafted and intimately scaled abstract urban landscapes. 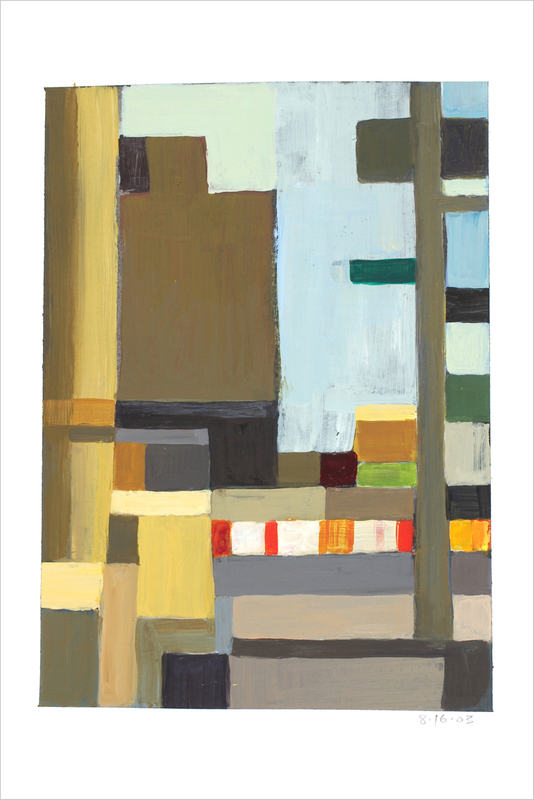 Her previous work organized the “banal chaos of urban detail” into flattened grids of carefully modulated, painted and cut paper squares and rectangles interwoven together not unlike a quilt or one of Mondrian’s grids. 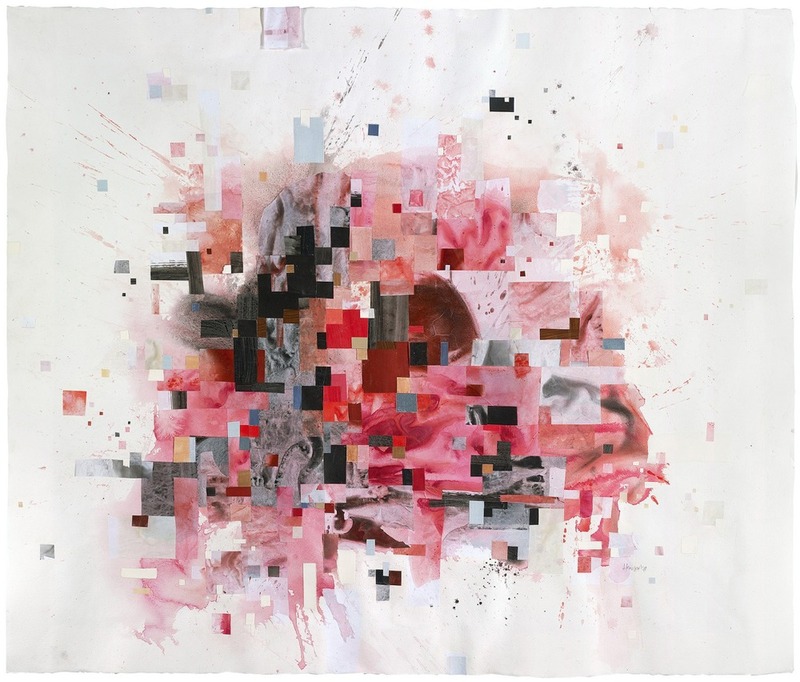 Julia’s latest work, the expansive and seminal piece “This Storied Heart” represents a breakthrough in her evolution of working with the grid and cubic pixilation. Moving away from strictly depicting urban scenes and external realities she is now staking new ground in the realm of the true “non-objective” composition. 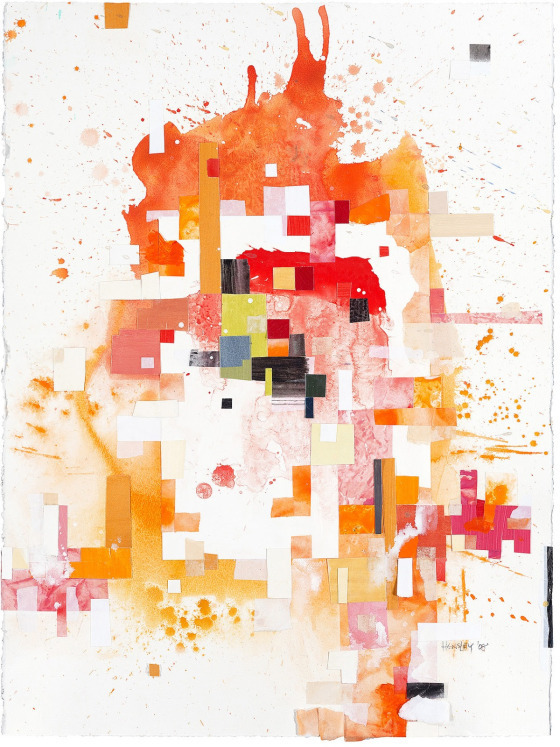 Working in a looser and highly intuitive way, “This Storied Heart” represents a slow natural accretion of cubic pixels, color washes and elusive imagery with no contrivance by the artist during the process. The result is a collage of remarkable organic complexity that visually mirrors the vicissitudes and intricacies of life and the human heart with a photographic clarity. Demonstrating equal measures technical skill and emotional sensitivity Julia has lead us to a place unforeseen at the beginning of her latest artistic journey." Excerpt from the press release by John Parkinson for the group show, "Inspired Geometries", at Form-Space-Light Gallery in 2008. 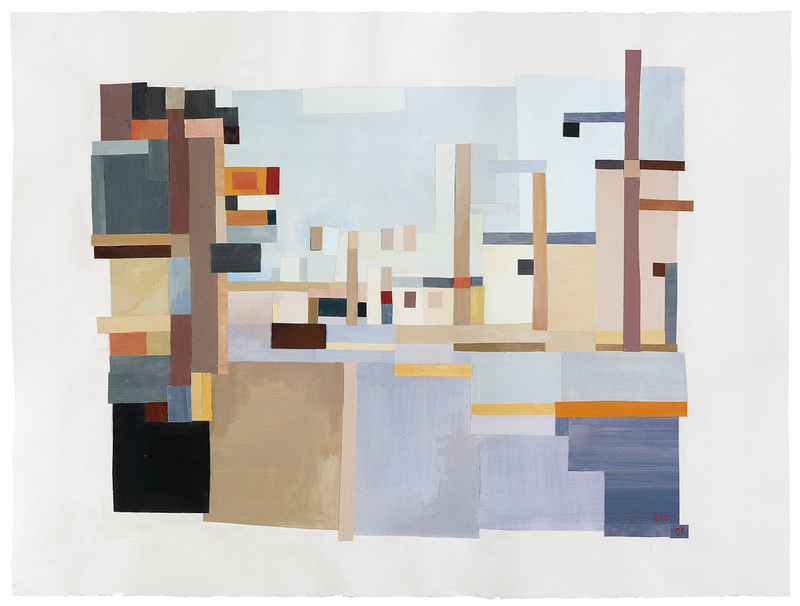 Georgetown, Gouache and Acrylic Collage on Watercolor Paper; 44 1/2" x 59"; 2008"Julia Hensley uses an invented perspective informed by cubism, pixilation, quilts, and Mondrian's grids, in which the city is seen as if from above and head on simultaneously. 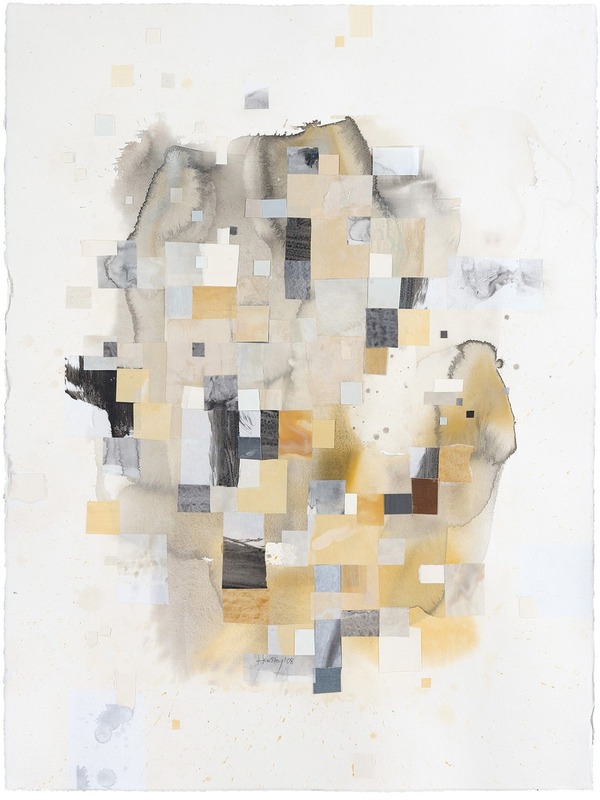 Her paintings and collages create an interesting friction between surface and illusory space. While her work [in this show] is derived from Northwest places, it also exists in an ultimately abstract, imaginary realm." Exerpt from the press release for Looking Out, Looking In, a curated group show at the Kirkland Arts Center in 2008. To read the full release, click here.